Conclusion: This features are suggestive of multiple metastasis. Patient would need further CT abdomen or an MRI examination. The MRI report done on 28 May 1999 is as follows: The liver is enlarged measuring about 9 cm. Multiple rounded lesions measuring 0.5 to 2 cm are seen involving both lobes of the liver. These lesions appear hypointense on T1W and hyperintense on T2W images. This indicates that the lesions are unlikely to represent haemangioma or cysts. There appears to be a 2x3x4 cm hypointense mass seen anterior to the left kidney. There is a 1 cm lesion seen in both suprarenalregions. These probably represent adrenal masses.Impression: Multiple rounded lesions are seen in both lobes of the liver which are not typical of haemangioma or cysts. These are probably metastatic lesions. A possible mass is seen anterior to the left kidney. Smaller 1 cm masses are noted in both supra-renal regions. 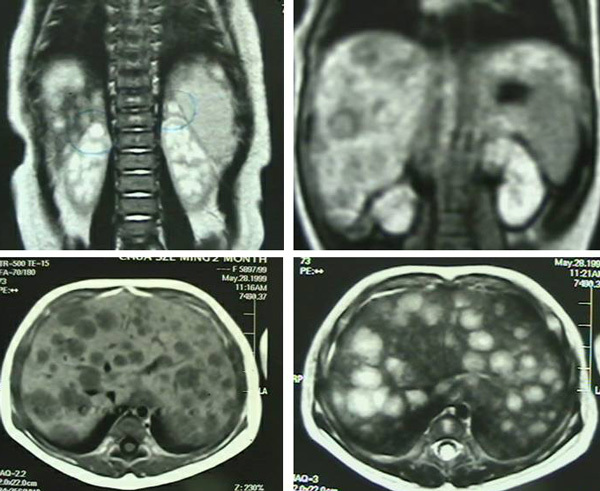 Neuroblastoma is a possible daignosis. Suggest a biopsy of the liver lesion to assess these. Specimen consists of several slender cores of brownish tissue measuring in aggregate 19x5x1 mm. Interpretation: Liver biopsies show metastatic small round cell neoplasm with feactures suggestive of metastatic Neuroblastoma. On this report is scribbled: Stage IV. Prof S … (S’pore). The doctor suggested that Baby undergo chemotherapy. The mother was told that she only has three to six months at most to live. The mother refused and the doctors scolded her, You money or your baby’s life? It was one June morning of 1999, when Chris received a phone call from one desperate lady who wanted to see him. Chris said this to her: I don’t know what I can do to help you … especially if she is only two months old … but if talking to you will be of help … then, come to my house immediately. Baby’s mother, father and grandmother came. Chris was stunt and numb-folded to see those liver lesions shown by the MRI. The mother was full of tears and as we talked for almost two hours. Things got better after that. At the end, every one smiled. Chris suggested taking AB powder and no oil, meat, milk, salt, sugar in the diet. Live on carrot juice – even for this two- month old baby. It is a hard advice to swallow. But what else can we do? The parents decided to leave Baby alone without any further benefit of medical intervention. 17 November 1999. The mother told us that the doctor did an ultrasound and said that there was no more swelling of the liver. The liver was softer and it had shrunk in size. Chris expected the worse and this was real great news. 23 August 2000. Baby and her parents came to our house. She is now 1 year 5 months and has not given any problems up to this day. She is a very active baby – and smart too! It is indeed a great joy to see her so well. We can not understand what had happened – or do we need to understand what had happened? Do we need an answer? To us, we lift up our eyes to the heavens and give thanks. The Almighty is Great and Merciful and He has blessed this baby — why? We don’t know that either, and we may never know. So, be it – let His will be done. The mother told us that Baby’s head smells of carrot! Yes, friends let the carrots go into your head and let you smell of carrots – so what, for as long as you are well. As for Baby’s family, everyone is happy and Baby now has a younger sister! EXACTLY ten years later, a lady and a young girl walked into our centre! It was Baby and her mother. Message 3: The use of commonsense in decision making is just as vital as the treatment itself. Baby was only two-months old when she was diagnosed with neuroblastoma, Stage 4. Chemotherapy was recommended but her parents declined. She was put on our therapy. Exactly ten years later, her mother brought Baby to see us – with tears of gratitude rolling down her eyes for this miraculous healing. Would you subject your two-month-old baby to chemotherapy? The questions to ask: What could have happened to Baby if she was “chemoed” when she was at two months old? What could have happened if her mother did not go against the doctor’s advice? It is not a poor judgement on the part of the doctor to insist that Baby undergo chemotherapy – even for a 2-month-old? A certain kind of nerve tissue anywhere in the body. But more generally it is associated with the nerves in the chest or abdomen. The other sites of development can be: lymph nodes, skin, liver (in which case it causes an enlargement) and rarely does a neuroblastoma originate in the brain. The tumour can spread widely giving rise to secondaries in the bone, bone marrow and liver. Rarely does it spread to the lungs. According to Dr. Victoria Dorr, the diagnosis of neuroblastoma can be difficult. The most common symptom of neuroblastoma is the swelling or presence of a large mass in the abdomen area. This may be accompanied by some pain or is painless. In cases where the cancer has already spread and affected the bone marrow, it may cause the reduction of the red blood cells, causing the child to be anemic. If the platelets are affected it gives rise to easy bruising, and in case where the white blood cells are lowered, the child has lowered resistance to infection. The cancer can spread to the skin and in which case it produces nodule. If the cancer has spread to the spinal cord it can cause a rare combination of symptoms such as sudden, uncontrollable eye movement, poor coordination, rigidity, spasm and weakness of muscle in the body, arms and legs. About 90% of neuroblastoma produce hormones such as epinephrine, which can increase heart rate and cause anxiety. Children under one year old and with small tumours have a very good chance of cure. If the cancer has not spread yet, surgery offers the best option of cure. If the cancer is large and has already spread, then chemotherapy and/or radiotherapy are indicated. The chemo-drugs that may be used are vincristine, cyclophosphamide, doxorubicin and cisplatin. Relief of symptoms can be obtained by the use of corticosteroids, such as prednisone.